After a UNLV study came out listing my favorite habanero hot sauce to be chock full of lead, I tossed it and went looking for an organic habanero hot sauce, but simply couldn’t find one. A lot of them have organic components, but the habanero’s never were. I decided to make my own. I found a great organic habanero powder on Amazon from Starwest Botanicals and some organic cayenne powder. The rest of the ingredients are mostly organic from the store, the tomatoes were homegrown. All quantities are listed in grams below, the first column is for one bottle, the second for four bottles. Blend all ingredients together with a hand blender (this is my preferred one), or food processor until all ingredients are thoroughly blended. Bring to a boil and simmer on the stovetop for 10 minutes. At the same time, prepare your bottles by sterilizing them and all utensils you will be using in boiling water. 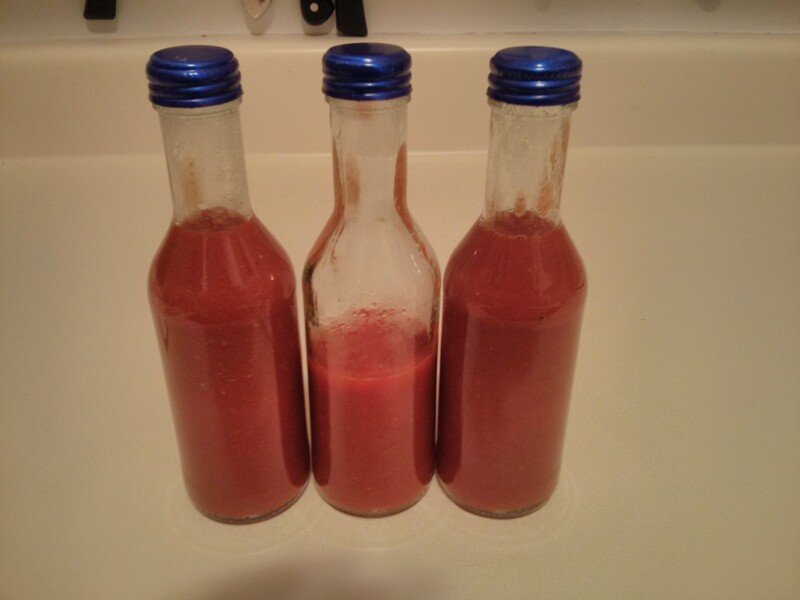 If everything is sterile when you cap the hot sauce you should be able to store it at room temperature until you open each bottle. For the bottles, you can reuse old hot sauce bottles or get some of the mini bottles of wine and empty those out (make sure they are glass).